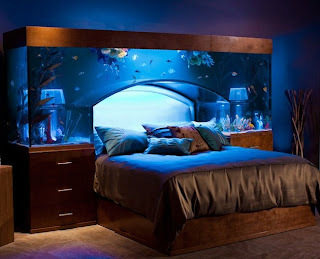 Because it's Monday and I've been in a long blogging pause, let's start off with this amazing view of the fish-tank-headboard. Imagine how relaxed you would be falling asleep there. Just like being on holiday. And not a cheap one. This tank which takes up to 650 gallons of water costs over 11.500$, it's custom made,...and this sum doesn't include installation. Nor the electricity bill afterwards. But what wouldn't people do for a good night's sleep?